76 Minutes For ARMORERS and NEW SHOOTERS alike…The M1 Carbine is another coveted WWII firearm that is collected and used in competition events today. Newly manufactured versions are also currently available. With many manufactures producing carbines during WWII subtle variations can be found between those original guns. 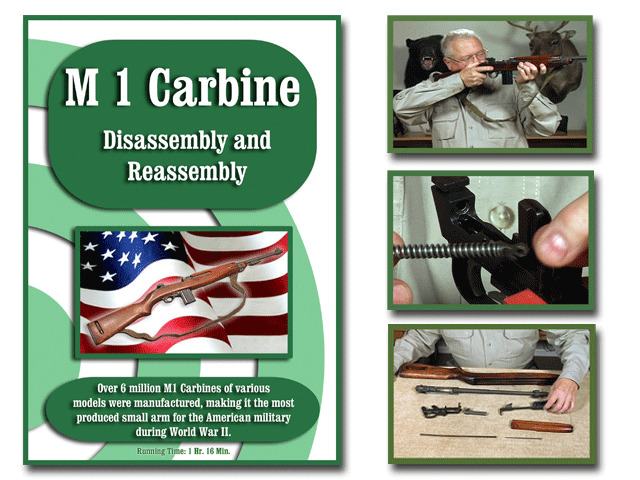 Our DVD does not attempt to show all the versions but will give you a good look at the M1 Carbine. This firearm is fairly simple to disassemble and reassemble, that is, if you are familiar with the firearm and the process. Some parts configurations, though, are more complicated than others. Knowledge of these parts and their configurations is mandatory to properly care for your firearm. This DVD was designed for the shooter who does not have the experience of the takedown process as well as for experienced armorers who need a refresher course. With this DVD, most gun owners can perform the complete disassembly, cleaning, lubrication and reassembly with confidence simply by following the easy to understand instructions. On-Target’s DVDs are digitally produced and provide clear and concise instructions. We at On-Target take great pride in the up-close videography of each DVD.